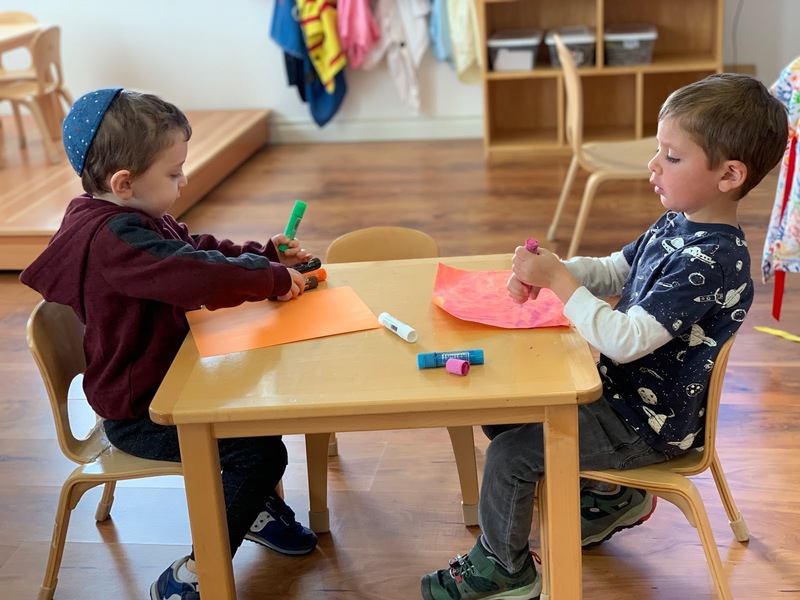 Our Mitzvah trees are a bloom. Judaism teaches that the formative years of early childhood are vitally important. A child is viewed as a seed that we nurture with the utmost care, since the seed's every experience will shape and color the quality of its matured self. Watching the Mitzvah fruit grow and multiply every year continually invigorates my goal and purpose as a teacher. I trace my inspiration to Maria Montessori. She believed that a child is "both a hope and promise for mankind." She believed peace in our world would come from children. To be peacemakers, children need two skills. First they need to find inner peace-the ability to calm and focus themselves to understand their own emotions. Secondly, they work on finding peace with others. At The Gan we help the children achieve this in a variety of ways. Choosing to do kind acts is foundational to developing a peaceful classroom. Since Rosh Hashanah we have been encouraging and noticing when our friends choose to do sweet kind acts. The Mitzvah trees show all the sweet kind acts. By June, the trees will be overflowing with fruit. It is a wonderful way to reinforce the kindness that is already occurring. What to we do when our friends are frustrated or angry? Firstly we acknowledge and help label their feelings. We want our students to know we see and hear them, and we will offer them help. Upset feelings can be a positive experience. Those feelings can guide us in our future decisions: What happened to cause me to feel this way? Do I need to do something differently? What can I do? Morah Katie: Looking at you, you don't look too happy Ozzie. Ozzie: Moshe, Eli, Evan, I don't like it when you roar at me when I am riding my bike. I don't want to roar at me when I am riding my bike. Moshe: We weren't roaring AT you, we were just roaring. Ozzie: Can you not roar? Moshe: We are on the playground. We can roar on the playground. Ozzie: You are roaring at my face. I don't want you to roar at my face. Moshe: We won't roar at your face. Ozzie: I could also just ride my bike somewhere else. What do we do when our friends become frustrated or angry with another friend? If we are lucky, children will see and read their friend's body language and facial expressions, and work to make the changes to solve problems on their own. This is a time when each child is developmentally, and appropriately, self centered. Subtle, non-verbal forms of communication can go unseen (unless your friend is stomping their feet, pounding the floor). The morahs step in as moderators to acknowledge body language and facial expressions. 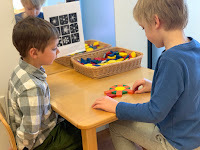 We acknowledge feelings, and offer to help the friends solve their problem. The morahs offer suggestions for words, phrases, and requests. The children can use those suggestions specifically or as inspiration for speaking directly to their friend while they discover a solution together. A peaceful resolution needs communication-something preschoolers are still working on. The passing back and forth of the rose is continued until all feelings have been expressed. When both children are done expressing themselves, they need to think of solutions which will allow BOTH children to feel better. Generally, this whole process takes a few moments. The moods of the friends begin to change when they share how they feel and realize they are being heard. We are utilizing tools from Conscious Discipline. One tool to compliment our daily mitzvahs, compassion and conflict resolution skills is Wishing Well. When we see a friend who is having a having a rough day, who is just struggling-and we have all just had those moments- we can wish them well. We put our hands on our hearts, take a deep breathe, think of something we love, and say: I/We wish you well. These are just a sampling of the things the morahs do daily to work to provide a safe and loving environment for the children. Learning to treat our friends with loving hands and kind words is foundational. Additionally, we strive to give the children a positive view of conflict and the tools to resolve it peacefully. When a child feels safe and valued their confidence grows.